I did quite a bit today, and am certainly going to bed soon. I’ve been out twice, to have lunch with my partner, and to check my postbox. I received only one package today, being a gem mould that I bought. Unfortunately, despite double checking all the description, the measurements weren’t labeled as centimetres, but for some reason, I had assumed they were inches. The mould is a cute 11 by 8 cm, and still useful at this size. 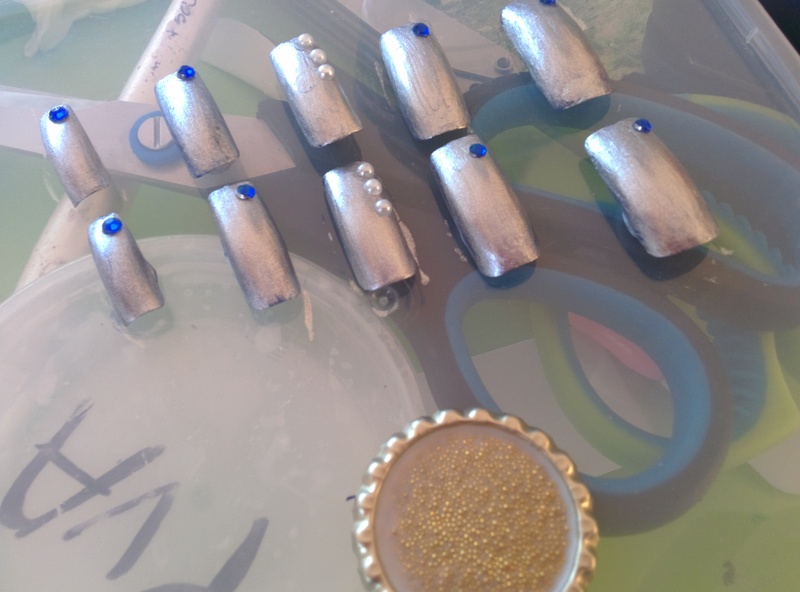 I am currently trying nail polish for the first casting, so I can look at the designs with detail. 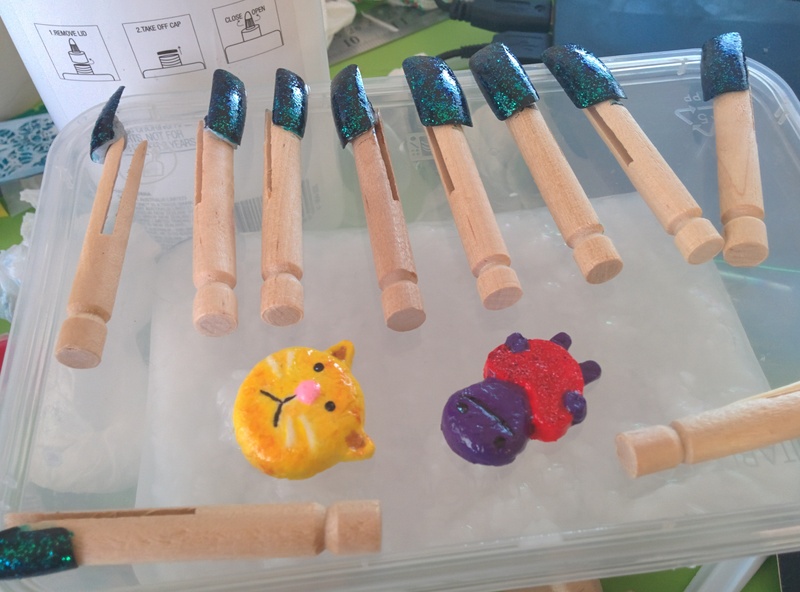 While I had the nail polish out, and had already filled the house with noxious fumes, I decided to give my fake nails a coat, as well as my tissue creatures. I’m not a fan of fake nails, I just wanted to paint on them, so I bought some cheap ones from eBay to practice. I thought of using glue dots to wear them, so I can take them off as soon as they annoy me too much, which shouldn’t be long. Yesterday and today, I have made a load of paperclay using toilet paper, water and PVA glue. I filled a few different moulds, which are all drying at the moment. This might take a couple of days, as they contained a lot of water. I try to leave them longer than I should, in case little areas like the nose are hiding wet spots down the bottom. It’s going to be hot weather tomorrow, so that should help it along. Having all this time isn’t making my house look any cleaner. I just keep making more mess! “I’m going to stay up tonight. There are things in this house that aren’t covered in glue and paper,” I declared to my partner, as he was going to bed. He looked at me with amusement and left the room. I had been reading the sports pages, strip by strip, as I covered random objects with paste and last weeks local newsprint. The end. Based on a true story. Today found myself in a shop with money and fifteen minutes to wait, so I looked for some things I needed to get, none of which I could find. 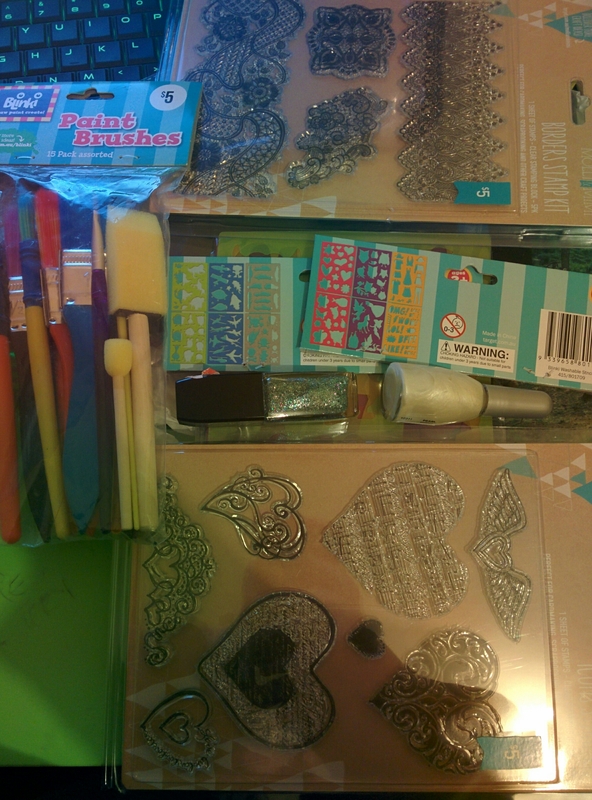 So I discovered they have a newly created teeny tiny arts and craft section. 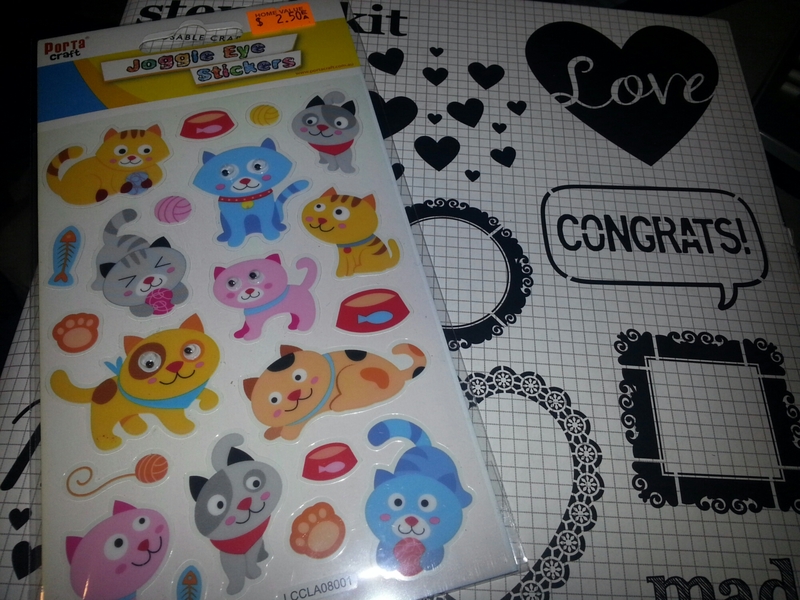 They were rather cheap and mostly aimed at kids, with a small card making rack. I picked up a few things from here. I got some stencils that were aimed at kids, but they looked rather vague for some of the complex designs that were there, and it looked like it would be fun filling in the blanks. I got the girl set and boys set, so 12 sheets in all, ranging from hearts, fairies and butterflies to monsters, cars and skulls. They had pretty clear stamps, as you can see, with large acrylic blocks. These designs will be great to use on cards, especially to emboss. 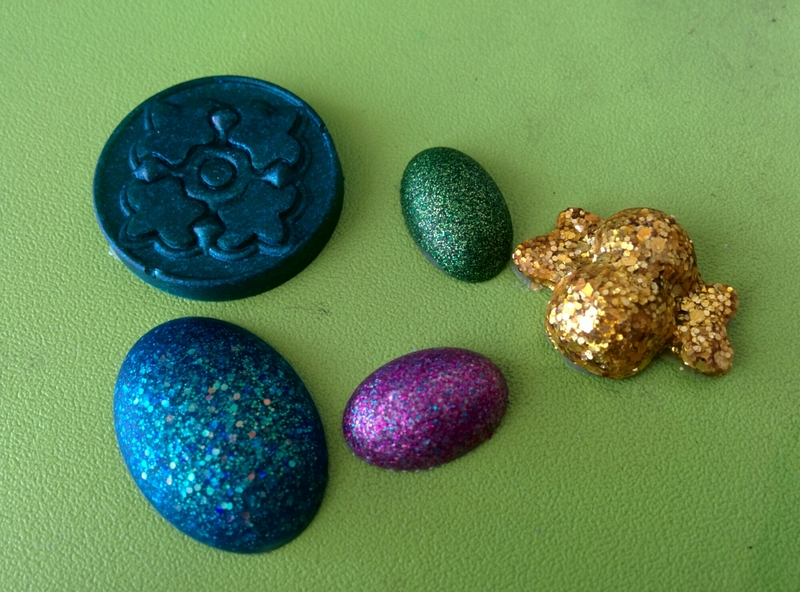 I also picked up a couple new nail polishes for gem making. I had the thought the other day to make a paper mache bangle. I was going to use a 600ml bottle, but I couldn’t find one. While looking for something else, I came across a masking tape roll, sitting right in front if me. I covered it in alfoil and added it to my paper layer rotation. So many layers. So little time. 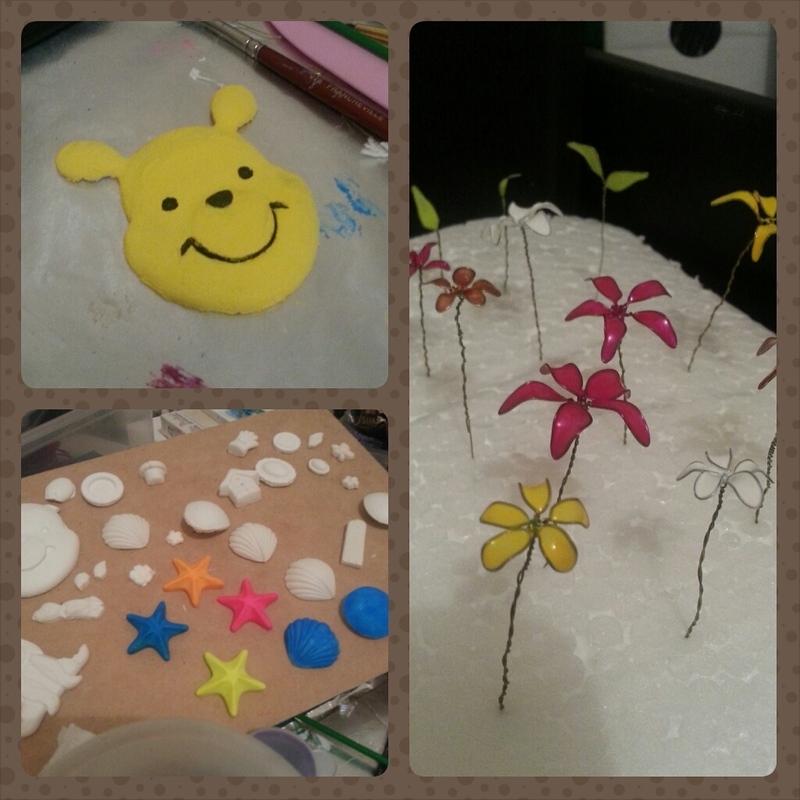 So, I’ve been growing some flowers, getting a Winnie the Pooh head in life and getting plaster of paris-ed. 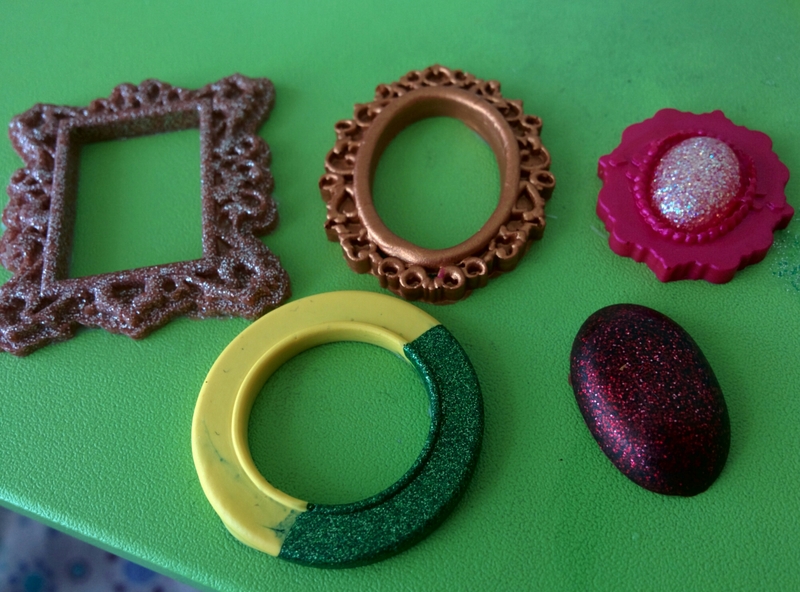 So, Winnie was taken from a mould I have where you stuff toilet paper and water into the mould and it makes super lightweight, super cheap embellishments with no difficulty added. It does take a little while to do, but it doesn’t need your undivided attention… Might be why mine took a while :P. But what you do is get a roll of toilet paper, rip off squares, then rip them into pieces. Depending on the size and detail determines how big the pieces you need are. I used a spray bottle to spritz whenever the paper got too dry. The reason you use toilet paper for this, and you don’t need glue is that toilet paper is designed to dissolve into pieces in water, so the fibres interlock and dry into their new shape. I learnt this off a you tube video (I can’t remember which one, sorry.) But if you search there, you’ll find video instructions. As for the flowers, I saw an idea making the nail polish flowers into a head-wreath. I’m not sure why, but the past load of these flowers I made got holes in the petals. Perhaps the polish was too old, or I didn’t let them dry properly before sticking then in a container and they poked each other. I’m thinking of putting another coat of polish once they are dried to make them stronger. I bought some floral tape, so that I don’t get stuck with all the wire in the head and hopefully it’ll keep it looking nice. Lastly, I’m getting around to painting my plaster pieces. It took a few days to dry, due to being the middle of winter. You can tell they’re dry when they are about room temperature. Cold = moisture = not dry yet… Unless you have a really cold room. 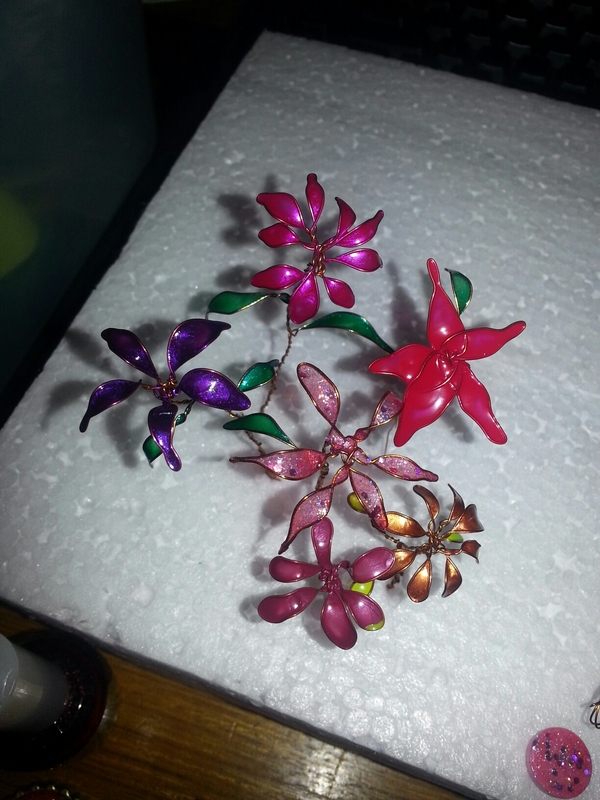 Before adding the polish, you need to make the flower, just get some thin, flexible wire and twist petals, a stem and maybe a leaf or two. There are tutorials on this on the net but I just played around until I liked the look. I used a polystyrene block to stick my flowers in as they dried. It’s quick drying but I think if you laid them down, all the polish would end up in one direction.